NOTE: For the complete list of AppConfigs and there stock/default values for MSx 8100, click here. This is the easiest way to find the AppConfig you're wanting to change. Simply type the name into the box and click Search. This is also a good way to find settings if you're not sure of the name. AspDotNetStorefront tries to make the AppConfig names as relevant to their function as possible. For instance, if you want to change settings for how product ratings work, a simple search for 'ratings' will return the applicable settings. 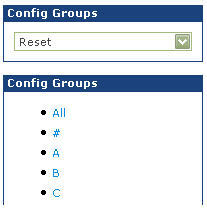 AppConfigs are broken into groups, to make finding the settings you need easier, and to organize related AppConfigs. The pulldown menu allows you to select a group of AppConfigs all related to a similar function - for example IMAGERESIZE or EMAIL. Choosing a group will cause this page to only display the AppConfigs in that group, making it easier to make the changes you want. You can also view AppConfigs alphabetically, with the links below the pulldown menu. Change the contents of the 'Value' field to your desired setting, and then click the Update button on the left. To quit without making a change, click Cancel. You can also change the config group the AppConfig is assigned to with the pulldown menu, or change the 'SA only' field (SA only stands for Super Admin only. Only Super Admin accounts will be able to change AppConfigs that have this value set to 1. See here for information on creating SA accounts). While the option is available, it should almost never be necessary to delete an AppConfig, and can often have undesirable results. Store admins can also create new AppConfigs, through this area of the page. 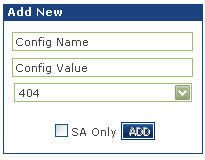 Simply fill in the name and starting value, assign a config group, check 'SA only' if necessary, and click Add. This is an advanced feature that will not be used by the majority of store owners. Additional development work may be necessary for your new AppConfig to have any effect on store operation.